Dr. Nabil Belkhir is a lecturer and researcher at the University of Ferhat Abbas Setif 1, working in the area of surface treatment of optical components. He received a Bachelor degree in 1989, then obtained an engineering diploma in 1994 and a Master’s degree (Magistère) in 1997 in optics an precision mechanics from the same university. He successfully defended his PhD in 2008. Inspire Magazine spoke with Dr. Belkhir to find out more about his work which won him and his coauthors the prize of the 2013 Algerian Paper of the Year Award in the category of Computer Science & Engineering. The winning paper is entitled “Morphological behavior and wear of polyurethane pads used in glass polishing process” and can be accessed here. Inspire Magazine: Thank you for speaking to Inspire Magazine, and many congratulations for winning the 2013 Algerian Paper of the Year Award in Computer Science & Engineering. How do you feel about winning this award? 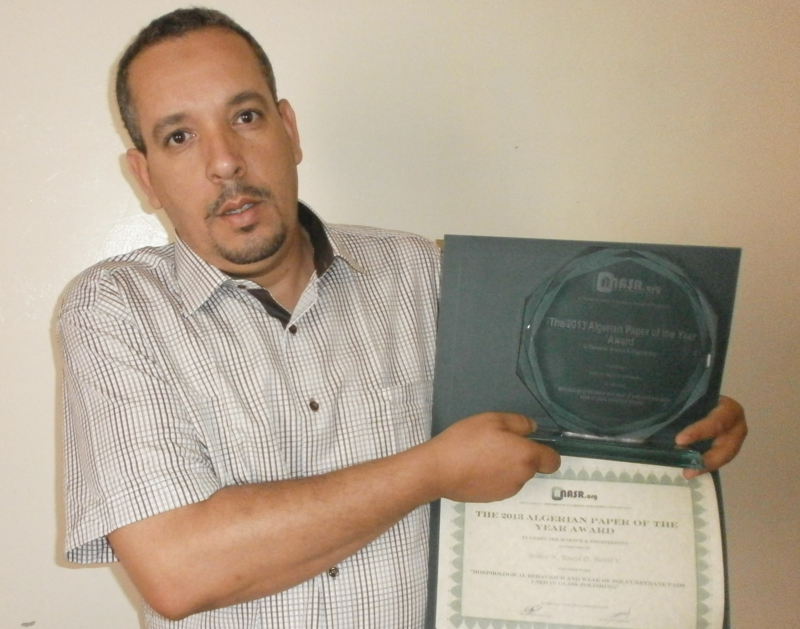 Nabil Belkhir: I’m very happy, it is an honour for me and for researchers in Algeria to receive this kind of encouragement. Nabil Belkhir: Our paper is part of a series of works that we published in the last few years in the field of manufacturing high precision optical components. The paper examines the “polisher”, which is one of the elements responsible for the quality of optical products. Optical components are things like the lenses, the prisms, or any other optical piece used in the fabrication of optical devices such as microscopes, and these kinds of devices are used for different applications including medicine and military industry. The manufacturing of optical components must be done with extreme care and precision, for example the lenses are shaped at first to give them a specific form (plane, convex, concave, etc.). Then, to produce a transparent surface – which is necessary for the function of an optical component – we use treatment processes called grinding and polishing. The work presented in this particular paper focused on the latter process. Polishing is a process where a lens is fixed on a special machine and suspension of hard grains in water are used as a tool to finish the surface. The surface of the lens must be put on a soft support called the polisher, the pad or the polishing pad. We studied the wear of this support because it influences the quality of the obtained surface. To decide on the wear of the polisher, some conditions must be respected such as the total tear, reducing its thickness or the total filling of the support pores – because it is a porous body – by the abrasive grains of the polishing slurry. For this study, we have made several experimental tests to see which parameters of the process influences it, the speed, the force, etc., and suggested how to use this support together with the optimum parameters of the machine to obtain a high precision surface of the optical compounds. Nabil Belkhir: It is important to address this problem because there is increasing demand for more accurate and high performance optical equipment. Performance in this case is closely related to the quality of optical components and thus to the quality of preparation operations. For example, few years ago it was difficult to obtain a surface roughness of optical components in the micrometer range, but today we are talking about Angstrom. This is now achievable by controlling and improving various parameters that can enhance product quality. IM: What is the exact contribution(s) of the paper to your field of research and how does it compare to other approaches that exist in related literature? Nabil Belkhir: Our work contributes to the understanding of a very interesting phenomenon and our results could enable manufacturers to optimize the process of optical components surfaces treatment. Compared to existing works in the field, this work will probably find its place amongst the most important work in this subject because it treats an element that is widely used in various industries. There is wide interest in the study of the polishing pad, its characteristics and effectiveness. In particular, research in this area focuses on two complementary parts, the elaboration and the characterisation of polishing pads. There is also a number of new materials available and widely used for polishers, amongst which is the polishers porous polyurethane. Our work contributes to the study of these new polishers focusing on “wear”, the phenomenon responsible for the quality of the optical components. The wear of the polisher refers to its deterioration and so it becomes a source of error for the surface quality. The difficulty to observe the deterioration of polishers for polishing operations makes a study of its useful life essential, and our study helps identify the parameters responsible for determining the useful life of the polyurethane polishing support (pad). These parameters include the polishing slurry, the applied pressure, the speed, etc. In general, all research effort of this kind helps clarify the complexity of the polishing process, there are many parameters that can influence the process, which interact in various ways, and that is why it is very difficult to define the effect of one parameter over others. Nabil Belkhir: This work is the result of the efforts of our team at the Applied Optics Laboratory of our Institute of Optics and Precision Mechanics at the Ferhat Abbas Setif 1. We had great support from our German colleagues mainly in the form of providing some equipment that does not exist at our laboratory and that happens to be very expensive relative to the funding available to us. Also, when it is possible to purchase such equipment, the buying process usually takes a very long time, so we often carry out part of the work in Algeria using available devices and the other part is done during our short visits (1 to 3 months) to Germany. IM: How did you get into this particular research and where does it fit in relation to other work conducted in your research lab? Nabil Belkhir: I found myself in this part of research by pursuing my other research interests in the same field. I first began by the study of the different finishing processes of optical components and their parameters. I started with another element which is the wear of the abrasive grains used in the polishing slurry. In this work I have studied all the wear aspects of the abrasive grains during their use in the polishing process and I have established their relationship to other polishing parameters such as friction, speed, and pressure. I must add that the abrasives grains are in the Micro and Nanometric dimensions which complicates their study. Part of this work was in fact published in an Elsevier journal on this topic and was ranked seventh in the top 25 in 2009. We are now focusing on the other element in the optical polishing process which is the polishing support, and this will help us achieve a fuller understanding of the quality of the polyurethane polishing pads and their useful life depending on all parameters of the process. These works are at the core of the research carried out at our laboratory where we investigate various aspects in the optical field: mechanical, material and optical. Nabil Belkhir: In my opinion, this type of research can contribute significantly in the development of the national economy, especially with the opening of the investment to the private sector. Optical technologies are found in various areas of activity, medical, military, e.g. the double lense or the periscope, as well as other daily activities such as in education. Yet the production of lenses that are used in Algeria is not done by Algerians but come from China or Europe instead, which is unfortunate. There is great demand and great potential for this area of research to flourish in Algeria, yet we are lagging behind with respect to other Arab countries. Since this area of research has close links to industry, industrial investments is needed to push it forwards. Nabil Belkhir: Thank you, and I wish great success to your magazine.